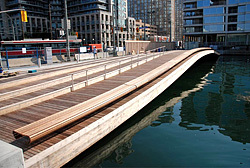 The Spadina WaveDeck, the first in a series of playful wooden gathering places at the water’s edge, has become a symbol for the revitalization of Toronto’s waterfront. With its playful undulating form, this 630m2 wavedeck creates public space in an area that was formerly a narrow sidewalk without access to the lake. The wavedeck combines innovative geometry, careful use of materials and detailing and unique lighting effects. It also includes the creation of new, high quality, diverse fish habitat. An important element in the master plan for Toronto’s downtown waterfront, the Spadina WaveDeck introduces new public space, promotes interaction with the lake and helps to create a coherent identity for the area.